What if your mother suddenly went missing? 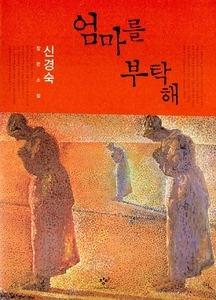 The word mother sometimes conjures up notions of sacrifice and devotion, particularly strong in Korean traditional thinking. For Shin Kyung-sook, one of the nation's most popular authors, a mother is a source of her writings. The 45-year-old author got inspiration from her mother to write the new novel `Take Care of My Mom." The novel portrays a mother from a different angle, in a story based on her real mother after a 15-day stay with her in her hometown. The story revolves around an old mother who lives in a rural area. One day, she comes up to Seoul to visit her children on her birthday. But she goes missing in a crowded subway station in Seoul. When she disappeared, she was with her husband. But he let go of her hand and was too late in realizing she was not with him in the hustle-and-bustle of the subway station. The family members desperately try to find her, publishing posters and posting her picture on the Internet and in newspapers. Park So-nyeo, the mother, was old and suffered from Alzheimer's so she wasn't able to find her children's houses. But other family members weren't aware of her illness. The book consists of four chapters in which the narrators are the daughter, son, husband, and finally, the mother. In each chapter, the narrators tell of their memories and experiences. As they look for her, they come to realize their indifference to her pain and loneliness. They realize their love for her because of their need. The first chapter � told by the eldest daughter and which is similar to the author's life story � tells of how the family begins to blame each other for the loss of the mother. They also don't understand why she cannot call them and get to them. The daughter's memory is about her mother's illiteracy. She remembers that when she was a child, her mother used to ask her to read letters from her brother in Seoul. The daughter also finds that the mother often suffered from bad headaches. When she took her to hospital, a doctor said she had suffered a stroke and the aftereffects triggered the headaches. All these memories strike her suddenly, reminding her of how much she and her other siblings don't know much about their mother. Hiding the pain, the mother gave her a good education because she didn't want her daughter to live like her. The eldest son tells his story in the second chapter. After his mother's disappearance, he goes out to distribute her picture to people. He tries to jog memories about his mother, who was particularly devoted to him as he was the eldest. She sent him to Seoul to go to college and later to find a job. Since then, she had sometimes visited him, but on the day she went missing, he couldn't pick his parents up at the station. "Why didn't I go there as usual?" he laments. Some witnesses say they had spotted her in the neighborhood that he previously lived in. They said she was wearing a pair of blue slippers with the top of her foot severely injured. But when he got there, he couldn't find her. He was the light of her life. When the mother left home after the father brought in a mistress, the son persuaded her to return by promising he would become the prosecutor she wanted him to become. He cries for reneging on his promise. In the third chapter, the husband of Park tells the story about his missing wife. As he waits for her to return, he learns more about her. He learns that she has supported orphans for 10 years without letting him know. He remembers she also underwent breast cancer surgery and suffered frequent headaches that were getting worse. But he didn't care much about her because he took it for granted that she would take care of him. In the final chapter, the missing mother tells her story about her children and husband. In the chapter, she confesses a personal story never told to the family that she was also a "woman" with dreams and emotions, not just a mother and wife. She talks to the family in a soliloquy about her state of mind, which connects the others' stories. Wandering the streets, she at last sees her dead mother, implying her own death. She says, "I desperately needed a mother my whole life." In the epilogue, nine months after the mother goes missing, the daughter tells her story again. She is visiting the Vatican, accompanied by her husband-to-be. She remembers her mother asked her to buy a rosary made from a rose tree. She buys it and finally reaches the Pieta Statue, which depicts the body of Jesus in the lap of his mother Mary after his crucifixion. She suddenly senses her mother might be not alive anymore, and thinking of her mother whispers, "Take care of my mother" to the statue. The four stories told by the four family members are put together as a complete entity of the mother. The author said that whenever she has difficulty writing, she calls her mother. "My mother always told me not to live like she did. She has a lot of stories to tell me and is always busy with work to feed her children. I want to go in my mother's way however hard it is," she writes in the book. "We've taken it for granted that our mothers are always here beside us and devoted to us. We think they are born to be mothers. But they were once girls and women as we are now. I want to show it through this book. My mother is the energy behind my writings," Shin said.